Home » Mazda CX-5 » What are the Trim Levels of the 2019 Mazda CX-5? The baseline trim level of the 2019 Mazda CX-5 is the Sport trim. This comes with the baseline engine option that will persist up through the Grand Touring trim. That would be a SKYACTIV®-G 2.5L inline 4 engine that produces 187 horsepower and 186 lb-ft of torque controlled with a SKYACTIV®-Drive 6-speed automatic transmission. Additionally, this engine option comes with a combined fuel economy of 28 mpg. The 2019 Mazda CX-5 Sport has a starting MSRP of $24,350. The 2019 Mazda CX-5 Touring has a starting MSRP of $26,615. The 2019 Mazda CX-5 Grand Touring has a starting MSRP of $30,045. The 2019 Mazda CX-5 Grand Touring Reserve trim level is the first to include a new engine option. This would be a turbocharged version of the standard SKYACTIV®-G 2.5L inline 4 engine. This improves horsepower to 250 and torque to 310 lb-ft. Furthermore, the Grand Touring Reserve and the Signature trims of the 2019 Mazda CX-5 come with standard i-ACTIV® AWD compared to standard front-wheel drive found in the previous trims. The 2019 Mazda CX-5 Grand Touring Reserve has a starting MSRP of $34,870. The 2019 Mazda CX-5 Signature has a starting MSRP of $36,890. How Does the Mazda CX-5 Lane Departure Assist System Work? 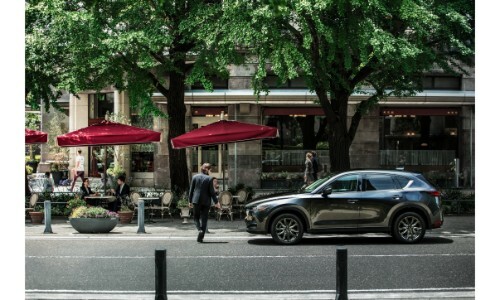 For more information regarding the 2019 Mazda CX-5, please contact us here at the Maple Shade Mazda dealership. We are located in Maple Shade, New Jersey within Burlington County. This entry was posted on Sunday, November 11th, 2018 at 9:50 pm	and is filed under Comparison, Mazda CX-5. You can follow any responses to this entry through the RSS 2.0 feed. You can skip to the end and leave a response. Pinging is currently not allowed.